Why Does My Email Program Keep Prompting for My Password? - Ask Leo! When your email program starts repeatedly asking you for your password, it's a sign of a problem. Most of the time, it's a simple problem. That’s Outlook’s way of saying something’s wrong. I kid you not. That’s all. In fact, it’s a very common technique — many email programs keep asking you for your password even if you’ve specified it, specified it correctly, and specified that it should be remembered. The most common cause is specifying an incorrect password. An account hack could mean your password is no longer valid. Just about anything that causes a login to fail can result in this behavior. By far the most common cause is excruciatingly simple: you entered your password incorrectly. Don’t scoff, and don’t assume this couldn’t happen to you. From what I see, this is the single most common reason that your email program repeatedly asks for your password. First, check the CAPS LOCK key on your keyboard. That’s often the cause — you think you’re typing in “AReallyGreatPassword”, when in fact you’re typing in “arEALLYgREATpASSWORD”, which is most certainly not the same thing. Verify your password by logging in to your email service’s web interface. If that fails, you probably need to initiate a password recovery process to set a new password. 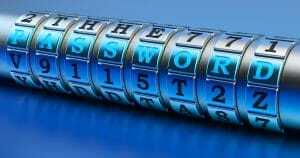 The bottom line is simple: most of the time, the problem is just getting the password wrong. Make sure it works elsewhere, and make sure you’re typing it in properly. One of the newer causes in recent years is the addition of two-factor authentication. If you enable two-factor (or multi-factor) authentication on your email account, it’s likely that your email program has no way to provide that second factor, or even to ask you for it. Some recent email programs hand off the authentication to the email provider. For example, rather than storing your password itself, Thunderbird might have you interact directly with Google to authenticate your Gmail account. This approach supports two-factor authentication. Unfortunately, older email programs can’t do that. Even specifying the right email address and password isn’t enough, since there’s no way to specify the required second factor. The result is that password box gets displayed over and over again. Most email services that support two-factor authentication also support something called an “app password”. This is a password you let the service generate for you, and it is used when logging into a program or service that can’t support two-factor. You need to check with your email provider to see if it falls into this category. If you suspect your account has been hacked, and that the hacker has changed your password, proceed immediately to this article for the next steps you need to take: Email Hacked? 7 Things You Need to Do NOW. If you attempt to log in to your email account using the web interface, and you’re absolutely certain your email address and password have been entered correctly, but you still can’t log in, your password is not what you think it is. Either you’ve forgotten your actual password, or someone changed your password while you weren’t looking. For people who have had their email account hacked, repeatedly asking for and rejecting your password is often the first symptom. If you can’t log in to the web interface because it says your password is wrong, it’s not your mail program that’s at fault here; you have bigger problems. 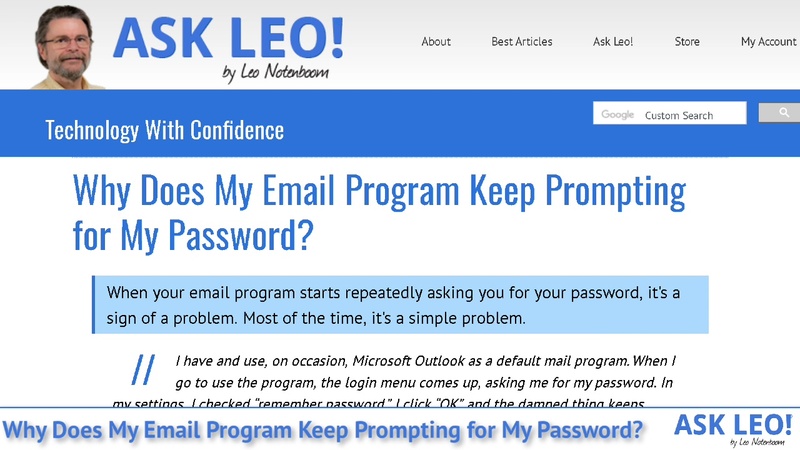 When you check (or send) email, email programs such as Outlook connect to your mail server and present it with your account ID and password. If the mail server rejects the connection for any reason, many mail programs will present the password dialog with no additional explanation. The program is essentially saying “I couldn’t log in; the password must be wrong” — even when it’s not. The mail server itself could be having problems. This isn’t something you can fix. See if you can find online status from your email service provider. Typically, this just goes away after a while. In the email program’s configuration, the POP3 or IMAP server name your provided could be wrong. In the email program’s configuration, the SMTP server name you provided could be wrong. In the email program’s configuration, you could have provided the wrong user ID, or mistyped it. Your internet connection could be down or having problems. A firewall could be blocking your attempts to connect to your mail server. This is also common if you specify an incorrect password too many times. … and lots of other reasons. And, of course, there’s always malware to consider as well. But the important thing to realize is: this is not the email program’s failure to remember your password. Instead, it’s the email program’s inability to connect and authenticate with your email service provider. And most of the time it’s because the password you’ve entered is wrong. Why Aren’t My Friends Getting My Email? - If your email service is on a blacklist it's going to be pretty hard to get it removed. Let's try a work-around and see if that helps. « Previous post: How Do I Move the Taskbar Back to the Bottom? I might go as low as 90/10, but this happens frequently when the passwords change via the web site (as someone else pointed out), and when people get a new machine or setup a new email program. Often. Outlook… which version? What e-mail? Older versions require Outlook Connector to connect to webmail such as Hotmail. Outlook Connector is notorious for asking for your password. I get this from time to time and it is virtually never because of a wrong password because I have it entered into my account properties with a check to “remember password.” When I get the login menu it seems to be because the mail server is down. I just close the window, wait a while, and try again. When I was having this problem with Outlook and Gmail once, something I read on Google suggested that the mail server suspected some kind of automated POP3-based spam attack and just wanted the human to authenticate on the Web, which I did and which fixed the problem, so I do this as a matter of course now whenever the problem occurs. This happens with our pop3 business account occasionally. It’s usually brief and albeit annoying, infrequent. The problem is that someone in the office invariably changes their password accidentally. When you keep outlook open all the time it pops that error message to the front of anything else you are working on in an active window by default. If you are in the middle of typing something and hit enter before you realize the message was there you can easily alter your saved password. My question is can you keep that message from coming up active in front of everything? I have the same problem with Thunderbird and AOL. Everything was ok up until 3 years ago, and somehow my email account decided to send out spam to hundreds of different people, who in turn complained to AOL. Now, even though I told them I had nothing to do with it, they seemed to have put some type of blocker on my accounts. When I try to transfer several different emails from one AOL account to another (mine) AOL account, it thinks that I am spamming people, and asks for my password. The only way that I can get around this is to send (transfer/copy/forward) no more than 3 emails at a time. Had this problem with outlook 2003. I read all I could on the password problem and found no answers. finally got it going!! Make sure you enter your pop server as pop3. Then make sure you have all info entered. Click test message button. If outlook fails to connect then click more settings and enter each box including display name and reply address. Go back and click send test message…….worked for me!! My Outlook 2003 remembers the ID/password information (check box ticked) so for me it is never because of a wrong password. It used to occur quite often with my former (technically incompetent) ISP but occurs very rarely with my current (Australian top tier) ISP thus supporting the theory that my problem is with the ISP or internet connection. I agree with Malcolm, this is very aggravating when it happens, but it is never truly a password or POP3 issue. I have 3 email accounts that Outlook 2003 handles. When this happens (infrequently), it is almost always just one of the accounts affected. The other two work without interruption. Plus, when I click on the OK button, it may 3-5 minutes, and it pops back up. If I close Outlook and reopen, it usually goes away. Again, no idea why this happens, so I’ve learned (as with many MS glitches) to live with it. I have Outlook 2002 still running and it WILL NOT save the password. Apparently Microsoft feels the program is too old and that feature will no longer work. I’ve tried a number of things suggested on the net to solve the program and none of them have worked for me. I have exactly the same problem as Gary, Outlook refuses to save the password so each time I open Outlook I have to enter my password. When I Googled the problem it seems that Microsoft chose to trash the program I had paid for by not allowing it to save the pass word. Microsoft say it is for security reasons but actually it is for financial reasons, they want me to buy the latest edition. I agree with Bruce. I have 3 e-mail accounts which Outlook 2010 handles and if it starts asking for the password (infrequent) for any of them the only sure way is to close and re-open Outlook. I just live with it. Actually, I find it very helpful, not frustrating, to do that. I got my hotmail hacked and it took time to recover it although the hacker(s) deleted ALL my contact list entries before sending a fraudulent message to all of them. Now, after I changed my hotmail to another hotmail account, I very often get not just the message asking for the passsword, but very often asking to copy the “characters” on a box, to make sure, it is not a spam or being hacked again. So, welcome this additional security, not condemn it. Using Hotmail in Firefox on a computer with XP I always have to put in my password by hand–it is never remembered, whatever I try. But I also can not sign out in the way microsoft wants me to do that. I suppose the reason for both is that I do not accept third party cookies. By the way, I am happy. I’m not really surprised. Hotmail, because of it’s long history and reliance on a number of other Microsoft related internet domains like passport.net, live.com, hotmail.com and who knows what else probably requires some number of 3rd party cookies for full functionality. Ahhh, yes. Sometimes your password dies of old age. The problem is compounded by having outlook only tell you that your password will expire WHEN YOU LOG IN as part of the login sequence. It doesn’t send you an email telling you that your password is on its death bed. this is not good if you use a mail client like thunderbird to get your mail for you. It is also not good if you have set up automatic forwarding from the outlook account to your main account. Haven’t found a good workaround for this yet. Sometimes the best thing to do is reset the program to require a password. Let it run a couple days, then reset to NOT require a password. It usually works for me. Other times it just refuses to cooperate. My Windows 10 Dell is set to never require a password, because I am the only one on it. But about once a week, it makes me supply the password. I have a poor memory, so it does make me remember the phrase. I’ve had this problem password issue with outlook 2007, which I use because of the better graphics in the tool bars which I need because of fading vision. I found a simple solution. I delete my email address from my POP 3 Rodad Runner account, restart my PC, re-enter the email account data and the issue is resolved. The problem seems to occur when I leave my PC in sleep mode overnight, or longer. 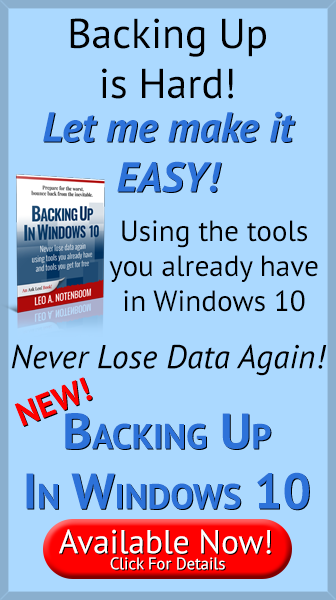 Shutting down overnight restores/maintains the operating system’s file integrity. I don’t believe that Microsoft is sabotaging old editions of Office Enterprise. Ending support was, I think, enough for MS. I definitely can relate to this problem which happens to me once in a blue moon. In my case, once I entered the correct password, the problem doesn’t seem to recur for a long period of time. In my mind, I think it is a way for Microsoft to verify that I really am who I said I am. That’s the way I see it. MS is checking up on me from time to time, which I consider a good thing for my own protection. That borders on a conspiracy theory :-). And no, Microsoft’s not “checking up” on you. Generally when it happens sporadically it’s a transient connectivity issue that interfered with your email program’s ability to connect. Remember, it may ask you for your password again for any reason that might cause a failure, not just a bad password. Maybe the wording of my phrase was not accurate. I should have said “verifying” instead of “Checking up on me”. Most, if not all, of my email addresses are grouped under my outlook (Office 365’s subscription) and I have at least 5-6 of them. Sometimes, I am in a different account and I am being solicited to enter the password for another one, which I found a bit strange at times; but I always see it on a positive side. I have the problem right now with IMAP and Outlook 2010 and it has occurred once before (had a techo fix on that occasion but unsure what was done ). My outbox has one item currently that will not send. I seem to be getting incoming IMAP mail still ok but linking to server for outgoing is not working and I get the pop up message constantly requesting I enter password which I do in spite of “remember password” box being ticked. It has worked otherwise without problems for years. None of the web suggested solutions seemed to have made any difference at all.